Why we should stop talking about weed like it's 1970:The truth about that "peaceful easy feeling. "If you ask a young person today about weed, what comes to mind isn't rolling a joint or taking a bong hit, getting the munchies and chilling out. In fact, cannabis today is practically an entirely different product than what most people think it is, so before you start saying, "What's the big deal about legalizing weed?" There's a lot you should know. With industrialization comes a political agenda, overpaid lobbyists, big marketing budgets, and not far behind, monopolies on manufacturing and distribution. There goes the neighbourhood. 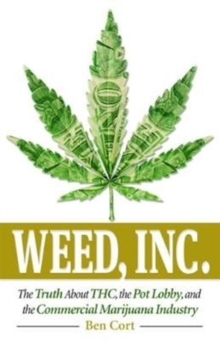 In Weed, Inc. Ben Cort responds to statements like:* It's not addictive* It's safer than alcohol* Nobody has ever died from weed* Crime will come down and the cartels will suffer* It will generate huge revenue for local and state governmentsFor every individual, every school and public library, and every bookstore committed to carrying the most up-to-date information on topics that affect families, government policy, industry, and social systems, this book is indispensable.